This adorable, multifaceted crystal teddy bear is decorated with pink or blue hearts and sits upon a crystal platform playfully clutching a heart banner. Your choice of Boy or Girl theme determines the color of the heart accents and banner message. Each figurine measures 3" x 3" x 2.5". Engraving area: Maximum of two lines with up to 18 characters per line. Enter information to be engraved using the Personalization Preview Tool or during the checkout phase of the ordering process. This gift will arrive packaged in a complimentary, signature GiftTree gift box for an impressive gift presentation. New Baby Crystal Bear with Free Engraving is a hand delivered gift. These gifts are delivered by one of our local design centers located throughout the United States and Canada. Same day delivery is available for most gifts when ordered before the cutoff time. 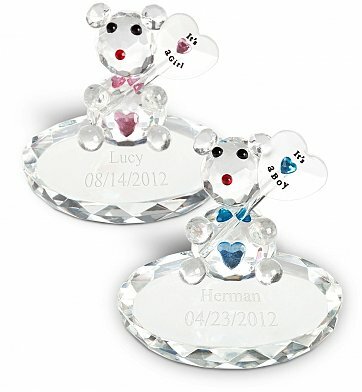 The cutoff time for New Baby Crystal Bear with Free Engraving is in the recipient's time zone. The mom and dad were thrilled with this beautiful gift. They especially loved the engraving. This was a gift so I never saw it. I could imagine that it is a beautiful keepsake.